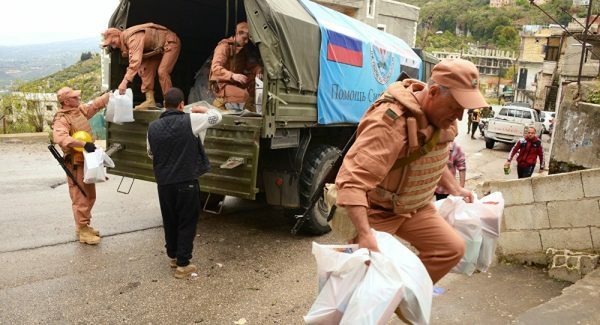 Russia sent humanitarian aid, timed to coincide with Orthodox Easter celebrations, to the residents of the Orthodox town of Muhradah in Syria's western-central Hama Governorate. DAMASCUS (Sputnik) — The Russian Defense Ministry's Center for Syrian Reconciliation and the all-Russian organization of veterans Combat Brotherhood sent 3.5 tonnes of humanitarian aid to the residents of the Orthodox town of Muhradah in Syria's western-central Hama Governorate, timed to coincide with Orthodox Easter celebrations, Dmitry Sablin, the member of the lower house of Russia's parliament, said Monday. “We wanted the fighting Syrians to feel the support from Russia in the Easter days. We are sending to the residents of Muhradah, who are repelling the terrorists’ attacks every day, the medicines for treating those ill and injured, products, gifts for children and even some Easter cakes from Russia,” Sablin said. He added that the Russian Defense Ministry’s Center for Syrian Reconciliation is also sending food packages to Muhradah. A total of 500 kilograms of medicines, more than three tonnes of products, as well as school kits have been sent to the town, according to the parliamentarian. “We wanted to support our Orthodox brothers, who are not leaving their soil despite the terrorists’ persecution. It is a part of the Holy Land,” Sablin stressed. Muhradah, home to more than 40,000 people, has been repeatedly attacked by terrorist groups, including Daesh (outlawed in Russia), operating in Syria. On April 1 Syria’s government army managed to recapture the town from terrorists after a two-weeks siege, according to media reports.